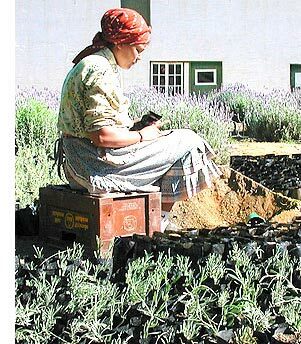 Lavender is best grown from semi-ripe cuttings taken in late summer or autumn. Cuttings may also be struck successfully at any time except during the months of deep winter. Select shoots from the current season’s growth that are fairly woody at the base but soft at the tip. They should be about 12 cm long; pinch out the soft tip, remove the lowest leaves and trim cleanly just below a node. Dip the base of each cutting in a growth hormone powder and sink into riversand or vermiculite with a dibber. Place in a cool spot, bright but not sunlit and keep damp, but not wet. Check regularly and after about three weeks, begin watering once a fortnight with a weak solution of 2:3:2. Once well established, pot up individually in a free-draining.